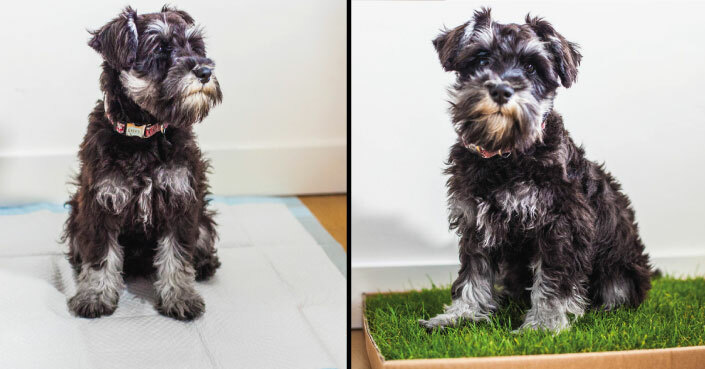 Piddle Patch is an effective, stylish and affordable dog litter solution. For decades, dog owners have tried to limit their dogs’ accidental toileting in the house by laying down pee pads or newspaper. And while this tactic has worked for some, it wasn’t the right solution for us or our dogs. We hated coming back to find yellow stained pee pads stinking up the room, and we felt guilty for all of the extra rubbish we were producing because of them. We knew there must be a better way to provide toilet access to our dog. The inspiration behind Piddle Patch came during a visit to the park. The dogs were happy to be in their natural environment and the stress associated with toilet time melted away because the dogs knew instinctively where to do their business. Wouldn’t it be great if we could replicate the outdoor experience indoors? Piddle Patch was born from that desire to bring a natural dog litter solution into the home. It’s made from fresh grass and grown in recycled textiles, instead of soil, to produce a longer lasting grass with a thick root system. While urine and odours are absorbed into the grass, solid waste should be removed and flushed down the toilet. Unlike pee pads, Piddle Patch is replaceable on a weekly or bi-weekly basis*. Piddle Patch grass is 100% biodegradable and can be placed into the garden waste collection, while its packaging can be recycled. You are house-training your dog and want to teach them to relieve themselves on grass only. Your dog has a small bladder and urinates frequently throughout the day. You’ve ever returned home to find your dog has had an accident in the house while you were away. Your dog is recovering from surgery, an infection or illness, and has reduced mobility as a result. You live in an apartment building and do not have easy access to a grassy area. You have a lawn but do not want your dog to relieve themselves on it. Your dog refuses to eliminate during inclement weather such as heavy rain, snow, ice or frost. You live on a boat and require an on-board dog litter solution. *With additional care, the lifespan of your Piddle Patch may be extended. The service and product piddle patch have offered has been superb. I subscribed as my puppy was undergoing a new vaccination treatment which meant he could not potty outside for 5 weeks. As he has now completed his vaccinations he is able to return to doing his business outside therefore we no longer require the piddle patch. It has been super convenient and made the last month very easy for me and my pup who instantly took to the patch as he recognised the texture and smell of the grass. Thank you piddle patch for your wonderful customer service.